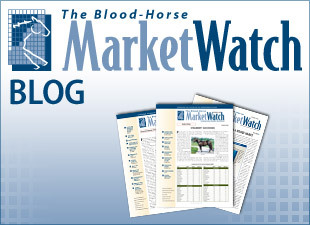 It will be seven years since an entering sire in North America breached $100,000 for a first-year fee. Animal Kingdom holds the highest announced fee for the coming season at $35,000, the highest fee for any incoming stallion since Curlin in 2009 ($75,000). While many bemoan the long drought of six-figures entering fees as a sign of a slow recovering market, this small study indicates that these lower fees are a much more realistic measure of a new sire's potential. From 1999-2000, 77 stallions have entered stud in North America with a fee of $25,000 or greater. Among those high-priced stallions were record-setter Ghostzapper at $200,000 in 2006, Fusaichi Pegasus at $150,000 in 2001, and Point Given at $125,000 in 2002. However, based on 2014 stud fees, the majority of the sires did not fulfill the expectations suggested by their high fees. The average entering fee of these stallions was $46,039; the average 2014 fee for those that are still active is -41% lower at $27,220. Only 22 (29%) will stand for $10,000 or more this coming season, and just 10 (13%) will stand in 2014 for a fee at or above their first-year fee. Nearly half of these sires are no longer active in the United States. While some have died or been pensioned, a large number (22, 29%) have been relocated outside of North America. Three of these sires were once the leaders by stud fee of their crop: Coronado's Quest led his crop in 1999 at $60,000, Came Home in 2003 at $40,000, and Empire Maker in 2004 at $100,000. The coming breeding season will be without recently relocated stallions Hard Spun (standing in Japan in 2014, entering fee of $50,000), Leroidesanimaux (England, $30,000), and North Light (England, $50,000). 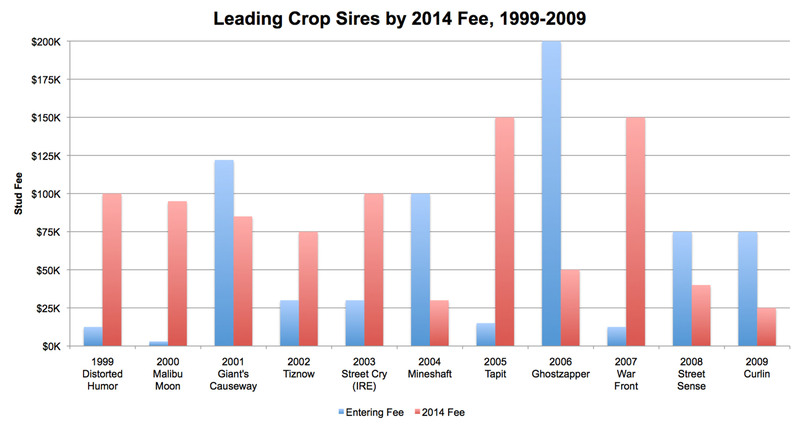 The leading sires by stud fee of each crop have experienced marked changes since their first year. Of the 12 original leaders, seven are no longer in that position and the remaining four have all experienced substantial decreases by 2014. Interestingly, of the six new leaders, only one (Giant's Causeway) entered for more than $30,000. New leaders Distorted Humor, Malibu Moon, Tapit, and War Front all stood for $15,000 or less their first year. Had Animal Kingdom raced 10 years ago, his historic wins in the Kentucky Derby Presented by Yum! Brands (gr. I) and Dubai World Cup Sponsored by Emirates Airline (UAE-I) may have merited a six-figure stud fee for his first year. But the current economy has changed significantly since Ghostzapper, Smarty Jones, and Bernardini entered stud. 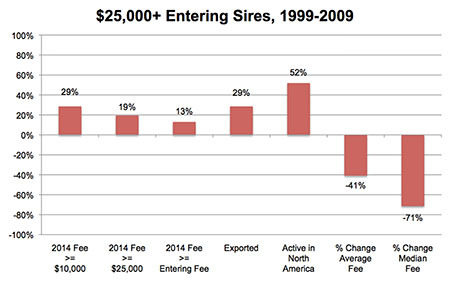 Even so, while $35,000 may seem modest, the stud performance of past expensive young sires suggests the current market's lower fees are a more reasonable standard for an incoming stallion.